Lace is a particular type of fabric, composed of holes. Traditionally making it was an exceptionally time-consuming task, when all fabric construction was time-consuming, (compared to weaving cloth or knitting socks, for example). So it was always a luxury item, reserved for small items like collars, trimmings on gloves or for special occasions like weddings and Christenings. Because of its construction it is not an easy fabric to deal with unless it is just attached at say the bottom of a petticoat, or to trim a sleeve. Using it to make whole garments – such as a wedding dress – can be very challenging. For a marvellous set of posts of doing this with vintage lace (with a little help from a cat) see Mary Funt’s amazing blog, Cloning Couture. When I was at college lace was one of the “difficult fabrics” offered as a dissertation. (I chose satin instead). My friend Anastasia (Cathy) Minvielle chose lace as her topic and I learnt something about it from her researches. She spent a fair amount of time in the National Portrait Gallery in London studying the old paintings, trying to determine what she could about the lace makers’ craft. If you want more detail try the Lace Guild. So here is a beginner’s guide. Lace is classified by the way it is made. Cotton, silk or linen thread was used traditionally. There are really two main types – needle lace and bobbin lace. The first is made using a needle and thread to create knots that build up to a design. Here is a very old, very fine example. The bobbin lace is when lots of bobbins are used on a pillow to create a pattern (a bit like a really complicated plait). I have just bought a piece of vintage Valenciennes bobbin lace that I will use once my blouse-making skills improve. There are other methods including knitting, crochet, tatting, macrame etc, techniques used to create lacey (or holey) textures. I was given a beautiful hand knitted lace shawl when my daughter was born – so fine it could be passed through a wedding ring. Unfortunately before the second baby arrived it went into the washing machine and shrunk. Crocheting and tatting can produce fine lace and was a common pastime in the UK until about 1930. My Grandmother and her sisters made a lot of these and it surrounds my mum’s table cloths to this day. Before there was the internet and TV many, there was only reading and conversation, much of which was accompanied by handicrafts and sewing. 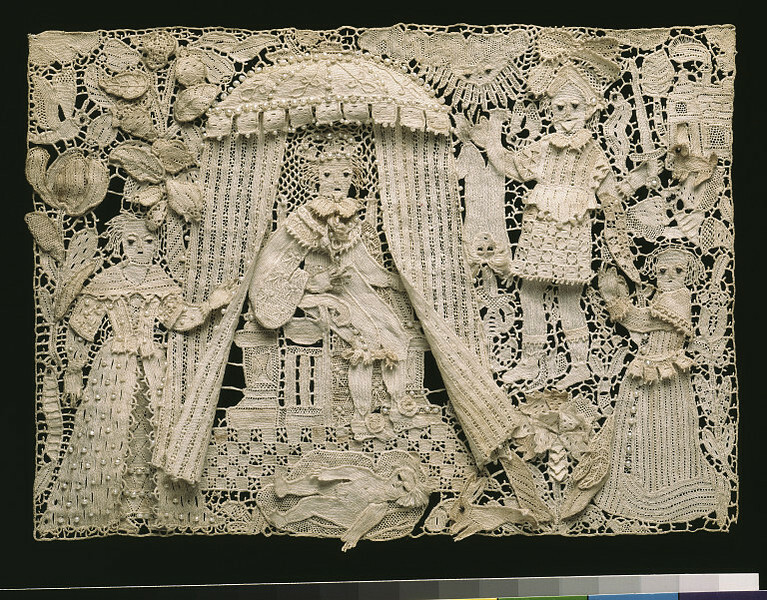 I also really enjoyed looking at this site which dates and analyses lace. In terms of modern dressmaking we are probably going to use machine made lace, or lace fabric made of something synthetic (from fabricland, ebay, and cheapfabrics respectively). With lace trimming we have either got an insert lace (attached at both sides and a space for a ribbon or further trimming), a lace trim which is also symmetrical, or an edging lace with some sort of scalloping. This is a very basic introduction, and just enough for the everyday dressmaker. Although I am myself a complete beginner I will cover some of the techniques I am learning about in a future post. Whenever I am in the San Francisco Bay Area, I try to stop in Lacis across the bay in Berkeley. Great supply shop for lace makers and lots of interesting displays. I have a piece of heavy brown lace I’ve been wanting to make into a skirt for several years. So I am reading with interest and may actually tackle it at some point. I do hope so. I have found it to be a pretty fun fabric! I enjoyed this post and look forward to reading about your further forays into using lace. Thanks for the mention. I’m currently working on a chantilly lace strapless dress and hope to get a post up soon. I’ll be focusing on the layout and tricks to work the hem. WOW…what a story that first photo tells! The world would be a dreary place without lace in all forms.